Originally elected in 2010, Scott Dyer is currently serving his fourth three-year term on the Montgomery Village Foundation’s (MVF) Board of Directors, and has served on the following MVF committees: Executive, Personnel, Communications, Committee on the Environment, Recreation, Nominating (Chair in 2013), Election (Chair, as well as Moderator of the Candidates Forum, in 2012 and 2015), and the 50th Anniversary Planning Committee; as well as also participated in MVF's Vision 2030 and the MV Master Plan process..
Scott has previously served as an elected Director on the East Village Homes Corporation's (EVHC) Board of Directors, between 2009 and 2016; he served on the following EVHC committees: Recreation & Environment, Parking & Public Safety, Publicity/Communications, External Affairs, Information Technology, Audit/Budget/Reserves, and the Dispute Resolution committee. During his time on the EVHC board, he assisted in the creation of a Neighborhood Watch program, in partnership with the Montgomery County Police Department. Scott is also credited for creating EVHC’s Facebook page and writing articles for the bi-weekly "East Village Echo" column in the Montgomery Village News. Scott is employed as a Client Onboarding Officer (Vice President), at J.P. Morgan Private Bank in Washington, D.C. Scott is also a Notary Public in both MD and DC, a certified Mediator and Facilitator, as well as a certified Voter Registrar with the Montgomery County Board of Elections. 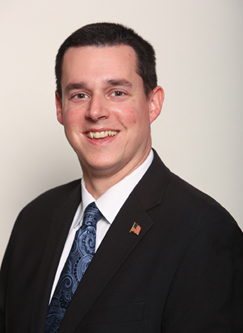 Scott’s notable former employment has included: State government (Maryland Department of Transportation), Federal Government (U.S. Department of Agriculture), and as a Realtor with Long and Foster (including the former Montgomery Village office). Scott currently volunteers with Junior Achievement of Greater Washington; he has served as a classroom instructor at Montgomery Village Middle School as well as an instructor at the Junior Achievement Finance Park, teaching a financial literacy program to both middle school and high school students in Montgomery County schools. Scott also currently volunteers as both a Basketball and Soccer coach for elementary school students at Mary of Nazareth Catholic School in Darnestown, MD. Scott has also been a twice-elected public official in Montgomery County (County Central Committee - two four-year terms), and is a recipient of the 'Call to Service' award from the President of the United States (in 2007 from President George W. Bush), highlighting his commitment to public service, leadership, and volunteer work. Scott is also a member of the prestigious Army and Navy Club in Washington, D.C., and a parishioner at St. John Neumann Catholic Church in Gaithersburg, MD. Scott, a lifelong resident of Montgomery County, grew up in Bethesda before moving to Montgomery Village in 2005. Scott studied Business at Montgomery College in Rockville and received his Business Degree from Marymount University in Arlington, VA Scott is married to Joy Kraus Dyer, who grew up in Montgomery Village, is an accomplished Interior Designer, a stay-at-home mom to their son, Joseph, and a former president of the EVHC Board of Directors. The Dyers live in Northgate. The Dyers’ prior townhome in East Village was notably a prior winner of Montgomery Village’s " Most Beautiful Gardens Contest " in 2008.